For emergency care after hours, please call 911 or go to the nearest emergency room. Visit the Neighborhood Clinic Patient Portal to Pre-Register to join our practice, Schedule Appointments, Requests Refills, Review Medical History & Lab Results, and view Messages. Have questions or concerns? Give the clinic a call, or send us an email. "It is our mission to inspire hope in our local community by providing preeminent care to our patients, by putting people first and embracing innovation in a warm healthcare clinic." 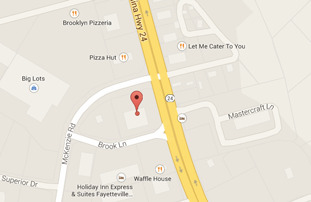 Our beautiful, state of the art, primary care facility is located in the heart of Spring Lake NC. Your team here at Neighborhood Clinic understands the healthcare needs of our community, and is aimed to provide compassionate medical care. We provide in house X-Ray Imaging, Rapid & Outpatient Labs, along with minor Surgical Procedures. Neighborhood Clinic is your full service Urgent Care and Family Practice clinic around the corner.